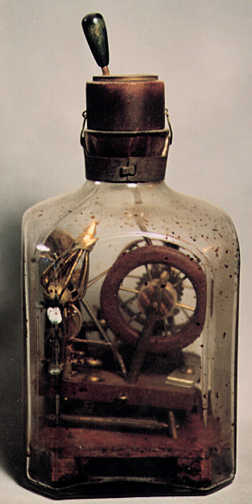 This incredible bottle contains a mechanized spinning wheel that turns with a crank sticking out through the top. 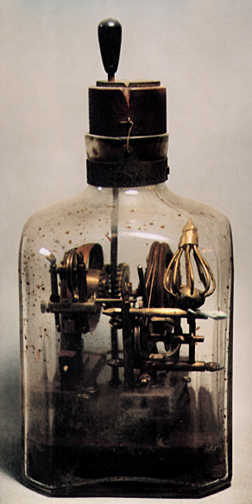 Mechanical bottles like this have been found in Germany, but this one is American. The top is made from a coin stamped "A Century of American Methodism" and right where the crank goes through, a hole was drilled through the date, but it reads 1 - - 5. Francis Asbury, the founder of the Methodist church in the U.S. was born in 1745, so the coin could have been from 1845, but the Methodist church considers 1766 to be the date of the birth of American Methodism. Perhaps the hole in the coin makes it hard to tell a 5 from a 6 and the coin is really dated 1866.